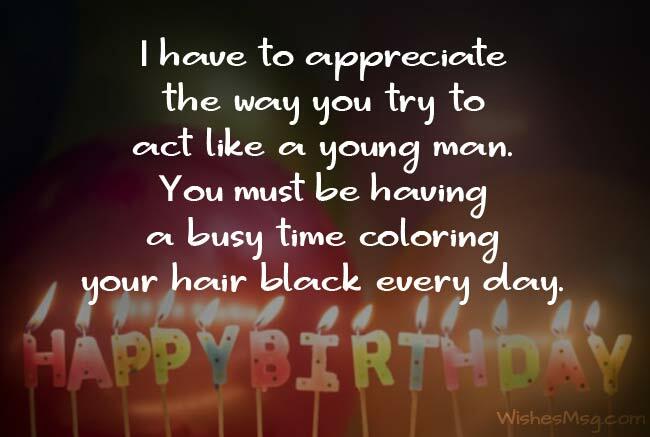 Funny Birthday Wishes : Your Birthday wish doesn’t have to be boring and conventional all the time. You can add some extra flavor of witty humor and mindless fun with your birthday wishes. Not only will they make your loved ones laugh but also make them see the funny side of you. So, why don’t you try to make your birthday wishes more interesting? You don’t need to be looking all over the internet for some unimaginably funny and witty birthday wishes. All you have to do is to sit back and have a look at what we have got here for you. 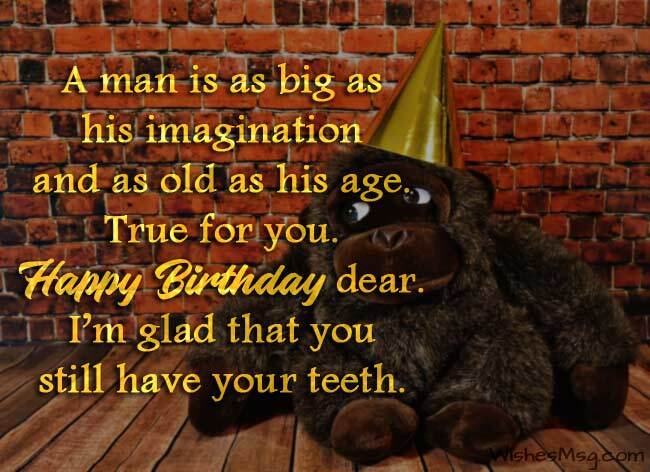 Here is our unique collection of some extraordinarily funny birthday wishes. 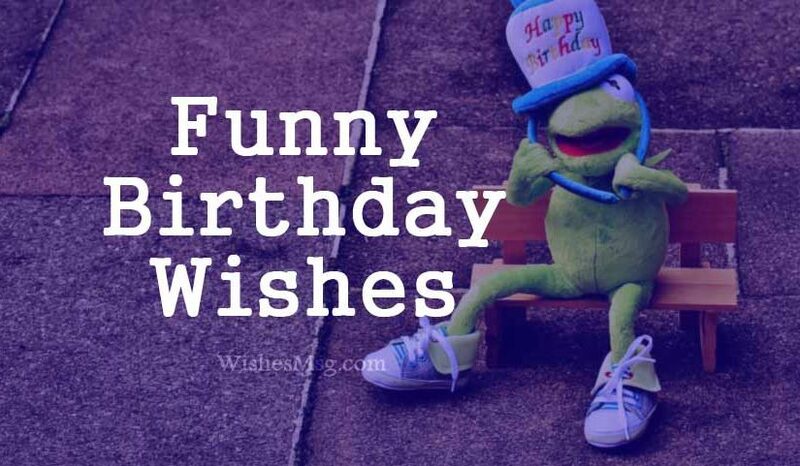 These funny birthday wishes are for your friends, brother, your sister, family, relatives and your colleagues. Funny birthday wishes are for your loved ones. Make them laugh on their special day! You have officially gotten past of the teenage years. Its time to be mature and stop expecting birthday gifts from people. Happy Birthday! You have been here for a long time, perhaps since the age of the cave people. No wonder why you are so backdated. Happy Birthday! Whatever doesn’t kill you, makes you older and uglier. Yes, that’s life my dear. Don’t be fooled by the illusions. Happy Birthday! There’s no shame in thinking like a teenage boy when you are old as the hills. Wishing you a Happy Birthday. May you live long! There’s nothing to be worried about getting old. Look at you, you are old and still doing great. Happy Birthday dear oldy. You have been alive for so many years and all you have gained in life is a big fat belly. That’s a big achievement for the loser. Happy Birthday! A man is as big as his imagination and as old as his age. True for you. Happy Birthday dear. I’m glad that you still have your teeth. I wish some people would stop wasting things. Just like you. You are wasting space on the earth and certainly wasting the time of others. Happy Birthday! Another delicious cake is going to be wasted today for the birthday of a useless person whose existence in this world makes no difference at all. Happy Birthday to that person! Today, anyone not mentioning in their wishes that you have gotten old and ugly, is a liar. Anyway, Happy Birthday dear, you are aging beautifully each year! Even if I was smoking cracks, I would still see the sign of aging on your face. How could anyone not notice that? Happy Birthday dear but you have to accept the truth! Have you ever thought what a stupid douchebag you were when we were kids? Guess what, you haven’t changed at all. Happy Birthday! If you are good at something, don’t do it for free. 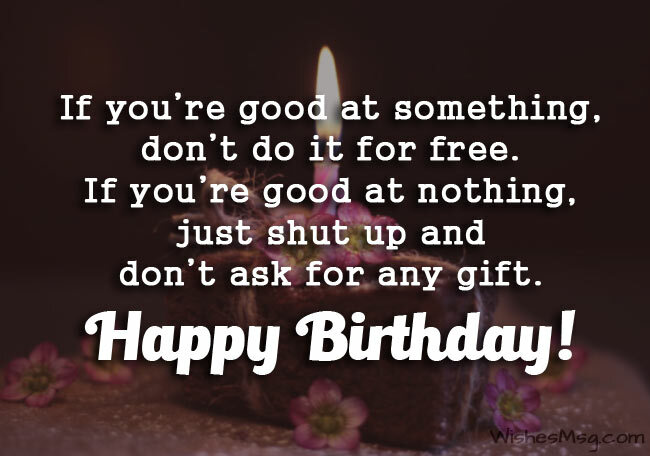 And if you are good at nothing, just shut up and don’t ask for a gift. Happy Birthday! A guy texts you on your phone, wishes you a Happy Birthday and next day, you think he’s gonna buy you some gifts? No, he is the one asking for a treat. Happy Birthday! The saddest truth of life is that some people get older without being wiser. You remind me of those unfortunate people. Happy Birthday! Friends like you makes me feel younger and more handsome. I wish you have two birthdays a year so you get older twice as fast as me. Happy Birthday! Everyone grows old but not everyone can grow wise. Don’t be sad my friend. Not everyone needs wisdom too. Happy Birthday! You’ll look great even when you have no teeth just like you are doing pretty well even without a brain. Happy Birthday my friend! I’m pretty sure you are missing your childhood so much. That’s exactly what people do when they get old. Happy Birthday! Some people are old, some are beautiful and some are both. You are not old enough to be called ‘old’ and certainly not good looking enough to be called ‘beautiful. Happy Birthday! You can pretend to be old when you are dead. Till then, you are just a little kid who wants to grow up someday. Happy Birthday, baby brother! Happy Birthday dear brother. I hope you will remain to be just as much annoying as now even when you are 100 years old. Happy Birthday to the boy who was found on the road and picked up by my parents. 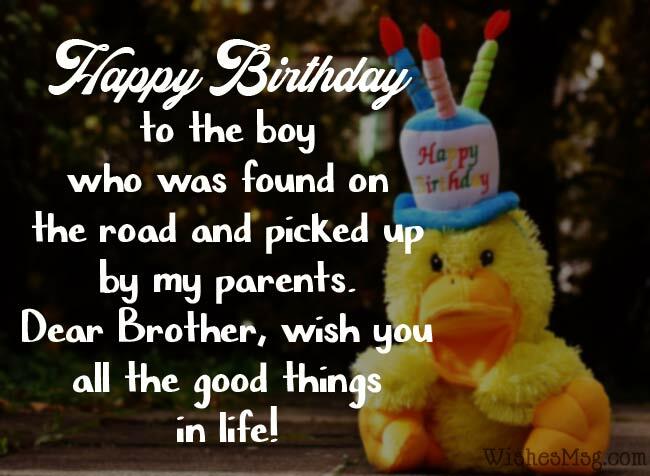 Wish you all the good things in life, brother! You are the epitome of stupidity and a living legend for annoying people. Bad luck for me that you are my brother. Happy Birthday! You know your life is a mess when your stupidity is increasing disproportionally to your age. That’s you brother. Happy Birthday! Life can be so unfair at times. I don’t know what bad I did in life to deserve such an annoying brother like you. Happy Birthday! I know you would have been so happy if I said, “you are aging so beautifully”. But sadly. Lying is not one of my good qualities. Happy Birthday! Enjoy your birthday this year to the fullest because who knows, after a few years, you might feel ashamed of your true age. Happy Birthday! Do you know why you are my favorite sister? Because you are dumb and you don’t even know it. Happy Birthday my dear! Birthday wishes nowadays are so full of lies. They may make you smile but the truth is you are not more beautiful than you were last year. Happy Birthday! Do you know what amuses me the most? Seeing that you are unable to hide your age even with this heavy makeup. Happy Birthday, loser! One more year has gone from your life and it seems like you are on a mission to be the fattest girl in the world. Good luck with that. Happy Birthday! I have to appreciate the way you try to act like a young man. You must be having a busy time coloring your hair black every day. Happy Birthday! Age is just a number, just like your salary. They keep increasing every year! So, why feel sad for one and happy for the other. Cheers to your birthday! Let’s have a night out in honor of your birthday. Let’s drink and party all night long. And of course, let’s not hope we end up at the hospital tomorrow. Happy Birthday! Age is just like a badge of honor. The older you are, the more respected you are in the office. Happy Birthday to you. Wish you all the best! We decided to buy a bog, sweet birthday cake for you. Although we are not sure if you are allowed to eat cake at this age. Happy Birthday! No one remains young forever. But you should have stayed young for at least a couple of years, at least for me. Happy Birthday! It’s hard to find some really good, funny birthday wishes on the internet. All that you will find are some conventional birthday wishes that make no difference at all. Nowadays, everyone expects something exceptional as their birthday wishes. Your loved ones have even more expectations from you. They want you to express your feelings for them in a different way. Funny birthday messages may seem insulting at times, but only your loved ones will understand the real fun of these wishes. Add some flavor of fun to your birthday wishes and see the difference by yourself.